Having 700 million active users from all over the world and labelled as the most popular app for messaging in the globe, WhatsApp has now been made available for Android users. With the number of people who have given their trust to this application, you should certainly try using it, especially if often talk to people overseas, as this messaging app offers you its free call and text features. Now, if you have been waiting for this and you wish to install it now, here are four steps for you to take. The first thing for you to do is to have WhatsApp’s latest version downloaded from Google Play. You must know that the version you will see on the website of WhatsApp is the 2.12.7 version. However, if you are taking it from Google Play, make sure that your Android device has the 2.11.561 version. If you have older versions, you would not be able to successfully download this application. After you have downloaded WhatsApp’s latest version on your phone and you are done with the installation process, seek for the help of another person who has also downloaded the application on their phones and ask them to call your WhatsApp number to check whether it is working or not. If giving missed calls for trial is not working for you, just like what many users are experiencing, wait for several seconds instead of instantly disconnecting the call. You will receive the call that the other person has made, but you need to be patient to find out whether you have successfully activated WhatsApp calling or not. Finally, once you have received the call and everything is working successfully, you will be able to see three tabs on top of your WhatsApp screen namely Calls – Chats – Contacts. If you see these three tabs, you are now ready to start using your newly-installed voice calling and messaging app. 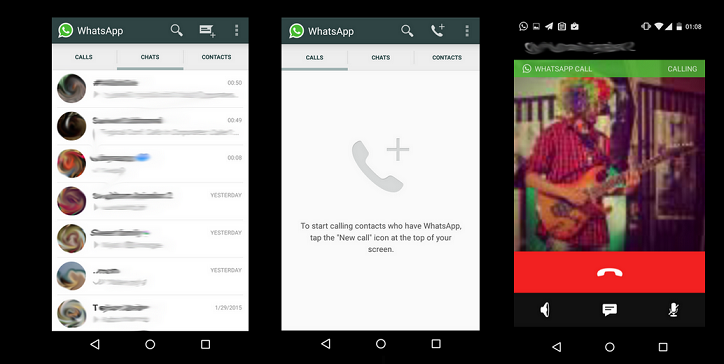 Now that WhatsApp is available on Android devices, what else are you waiting for? If you wish to save a lot of money as you call and send text messages to your friends, family and loved ones here and abroad, WhatsApp is, indeed, one of the best ways to do that. Even with the countless call and text messaging applications out there, most phone users still choose to use this application and they have their own sets of reasons why.